From the German analogue audio specialist Clearaudio came a new vinyl playback package called the Concept Active that gives new meaning to the term ‘all-in-one’. Basically, the ingenious package combines the ingenious and well-regarded Concept turntable and Satisfy tone arm, adds a Clearaudio Concept MC phono cartridge, and then incorporates both a built-in phonostage and a headphone amplifier. The upshot is a package where all you need to get started are some good vinyl records and either a hifi system or a good pair of headphones. Going from zero to vinyl has never been simpler (or executed in a more classy, eye-pleasing way). The Concept Active is priced at €3,310. 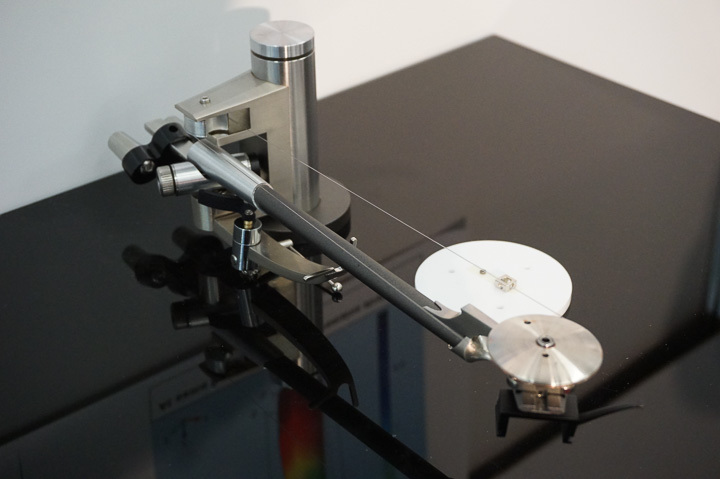 Also new for Munich from Clearudio was the Tracer tone arm, which neatly takes its place in Clearaudio’s extensive ‘Tonarme’ family between the present Magnify and Unify tone arms. The Tracer is described as a minimalist design that places an emphasis on stable positioning of the phono cartridge above the record surface. The Tracer is offered with either silver or black carbon fibre arm tubes and sells for €1,900. 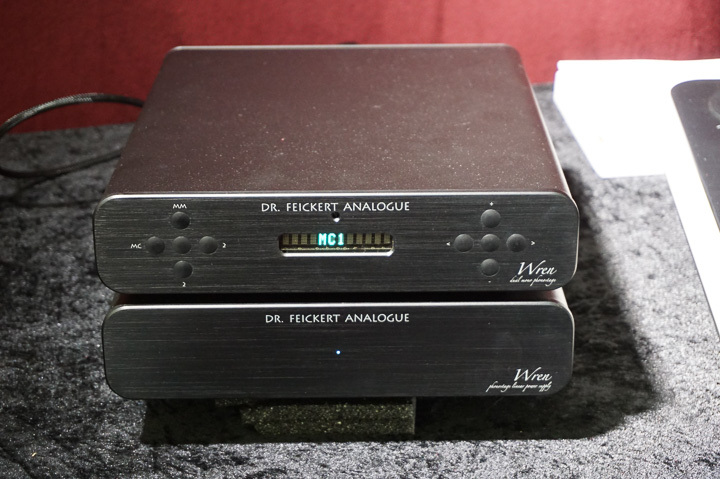 Many enthusiasts are familiar with the ingenious and extensive range of analogue set-up tools offered by Dr Feickert Analogue, as well as the firm’s beautifully made line of turntables, but for this year’s Munich event Feickert took its first-ever step into the world of analogue electronics as embodied in the new Wren phono stage (€7,000) and its companion Clean linear power supply (€749). The uncommonly versatile Wren can handle MM and MC cartridges and offers extensive programmable gain and loading options for multiple cartridges, which also can be adjusted on the fly. Once an ideal combination of settings is selected, users can store those settings in an internal database and label them, for example, with the name of the specific cartridge for which they are intended (e.g., “Lyra Atlas”). Funk Firm’s chief designer Arthur Khoubesserian unveiled his cost-no-object, shoot-for-the-stars AK1 tone arm, which will be priced at £24,000. The AK1 is a pivoting, tangential-tracking tone arm whose headshell is carried on a precision-made articulated mount and that—via a thread-driven cam-like mechanism—gradually adjusts its tracking angle to maintain tangency to the record groove as the arm traverses the record. In particular, Khoubesserian has laboured long and hard to eliminate all potential sources of bearing play in the connection between the headshell and the main arm tube, which is itself a resonance-free structure that leverages technology created for Funk Firm’s critically acclaimed FX-series tone arms. In a conversation with Khoubesserian, the designer explained in some depth ways in which he thinks the design of the AK1 should enable it to outperform present day radial-tracking tone arms and also other articulated-headshell tangent-tracking tone arms presently on the market. At this stage, Khoubesserian plans to build just 50 of his exquisite and more-or-less hand-built AK1 arms, but our educated guess is that those might sell out surprisingly quickly. If this happens, it means Funk Firm might soon be faced with a decision as to whether to build more. Kuzma’s 4Point tone arms in both 11-inch and 14-inch lengths have received critical acclaim from Hi-Fi+ and other publications, but with this said there are two potential problems with the arm(s). First, they are big and comparatively heavy, thanks in part to Kuzma’s beautiful but also massive VTA adjustment towers, which are a standard feature on the 4Point arms. Second, they are expensive (selling in the US for between $6,675 - $7,080, depending on the wiring options specified). 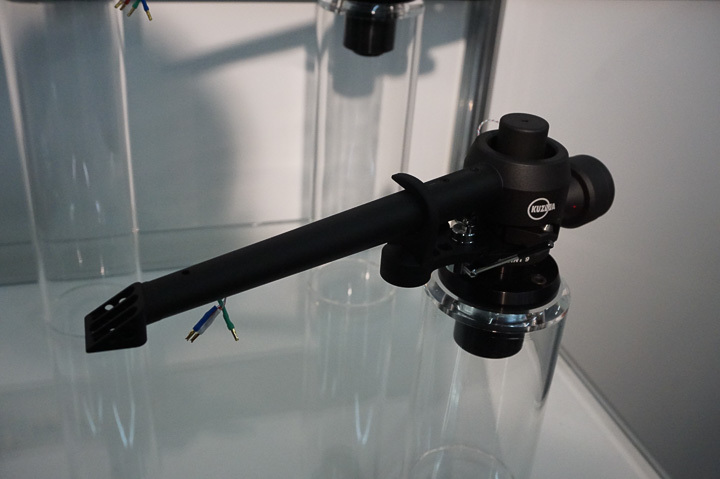 For Munich, though, Kuzma tackled both problems by introducing its new 4Point 9-inch arm, which is provided sans the aforementioned VTA tower, but is there for lighter, more compact (thus fitting on a wider range of turntables), and considerably less expensive. In fact, the new 9-inch 4Point will sell for €3,600. For those who have yearned for a cost-reduced and also more compact version of the desirable 4Point arm, your moment has arrived. 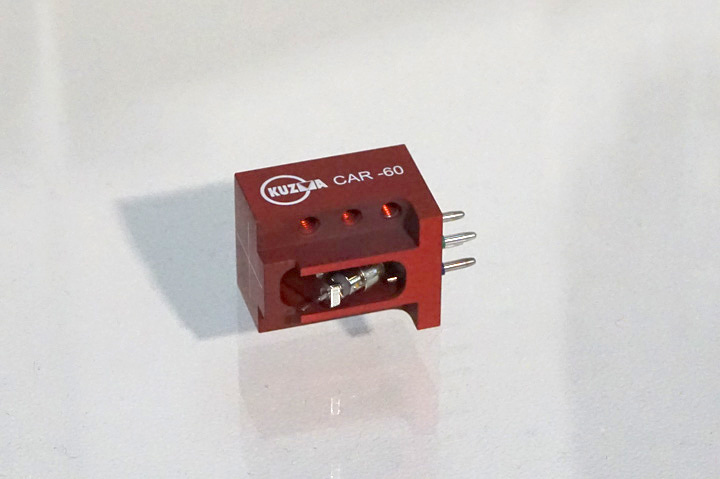 One other new development from Kuzma was the launch of what is by far the firm’s most exotic moving coil phono cartridge to date: namely, the CAR 60, which features (gulp!) a diamond cantilever and sells for €12,700. When Franc Kuzma took the CAR 60 from its case so I could snap a photo of it, he handled it with the sort of extreme care I imagine would be reserved for transferring vials of nitroglycerin to and from safety cases. Given its lofty price, the CAR 60 is one phono cartridge owners will want to keep far, far away from curious but potentially ham-fisted visitors. Primary Control is an analogue audio specialist from the Netherlands that offers an unconventional and very well thought-out direct drive turntable called the Kinea (€12,000), which can be fitted with any of several Primary Control tone arms. 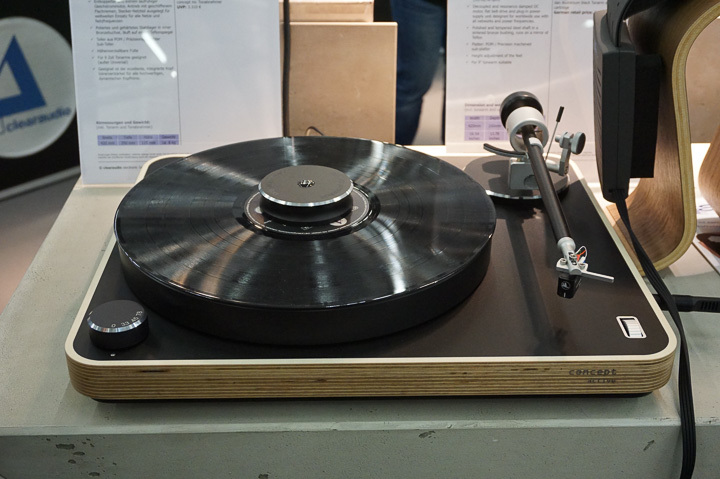 What caught my eyes and ears, though, was the firm’s new field coil loaded FCL unipivot tone arm (€25,700) and the closely related Gravity tone arm (€13,900). Under the FCL concept, one starts with a very high quality unipivot tone arm design, complete with a unipivot bearing positioned at the arm’s centre of mass, but then adds an externally powered and controlled constant current field coil torsional stabilisation system. Multiple benefits accrue, including a unipivot design that is free of bearing chatter, offers rock solid torsional stability (unlike other unipivots, the FCL doesn’t rock from side-to-side), offers very low friction, provides a non-friction magnetic anti-skating mechanism, and incorporates a low resonance arm wand. The net effect is of having a unipivot that does everything you would want a unipivot to do, but with no adverse side effects (in particular, no torsional rocking motions to contend with). The FCL isn’t cheap, but then cutting edge designs never are. Happily, the firm’s Gravity tone arm incorporates much of the thinking behind the FCL but at a (somewhat) lower price point. The Kinea, though not new for 2017, is a big, beautiful variable-torque “coreless direct drive” turntable with an oversized 360mm platter. The motor is a relatively low-torque, brushless, air core design that is geared to minimise magnetic motor cogging effects. On start-up, however, the motor can temporarily go into a 5-second period of high-torque operation to bring the platter up to speed, but thereafter reverts back to a low-torque “standy” operating mode. An electronic regulation system enables variable torque operation. 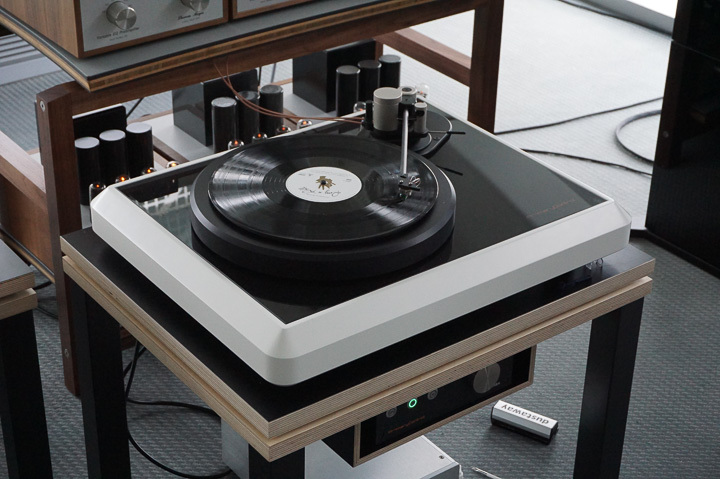 The platter is a five-layer composite, while the spacious plinth of the turntable allows room for arm boards supporting 9-inch to 13-inch tone arms. Sonically, I was struck by the Primary Control analogue rig’s light, lithe, agile, and noise free presentation. Further listening is indicated. 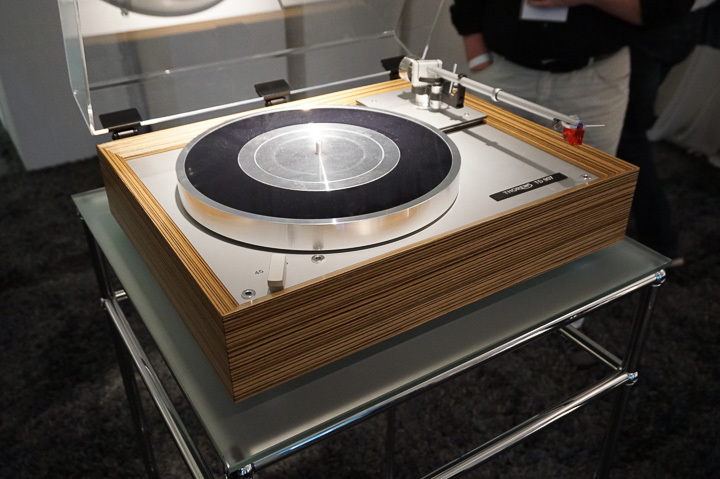 The German firm Thorens showed a family of three new 900-series turntables comprising the entry-level TD 903 (€6499), the mid-level TD 905 (€7999), and the flagship TD 907 (€11,500). All three turntables are thoroughly contemporary in internal design, but their external appearance features a deliberately retro look that is intended as an homage to classic Thorens turntables from the past (specifically the TD 160). All three turntables use a three-spring suspended sub-chassis design, plus high-rigidity plinth top and bottom plates fashioned from an internally dampened yet also stiff laminate of aluminium and polyethylene. The TD 903 and TD 905 come with glass platters and 9-inch TP 92 tonearms, while the TD 907 comes with a machined metal platter and a 10-inch TP92 arm. In many respects, the TD 905 is a “TD 907 Junior” and although the TD905 does not carry the full set of features that the TD 907 does, it can be upgraded at a later date to become a full-on TD 907 via a pre-planned Thorens upgrade path.